On July 15 archeologists opened a bark cocoon found in the far northern region of Western Siberia, and were amazed to see that it contained the mummy of a 13th century child wrapped in fur. Archeologists unearthed a grave tentatively dated to the 13th century in the village of Zeleniy Yar in the Yamalo-Nenets Autonomous Region in Western Siberia. The grave contained a bark cocoon 1.30 meters in length and 30 centimeters wide, and when it was opened on July 15 scientists were astonished to find the mummified remains of a child. According to archeologist Alexander Gusev, who works at the Center for Arctic Studies, the mummy is well preserved. 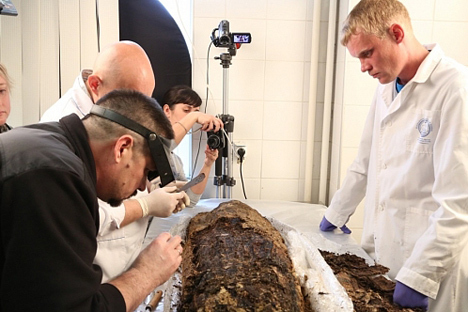 "After the season ended we opened the mummy in the museum in Salekhard," said Gusev. "We did not open it in the field because we wanted to examine the body carefully. Under the bark cocoon we discovered the mummified body of a child. It was wearing characteristic fur clothing. Next to it there were many metallic domestic items and decorations. It seems that the child had died of some kind of disease, and was not violently killed or traumatized." Gusev said examination of the body continues, and conclusive results will be possible only after scientists finish their research. Soon after the cocoon was removed from the ground experts suspected that it contained a mummified child. "It has the outlines of a human body," explained Gusev. "The cocoon had not been damaged and the conditions in which it was kept help preserve the remains. The find is very interesting." Excavations in Zeleniy Yar began in 2013 when scientists discovered seven objects that led them to suspect a burial site. "After the news I immediately joined the archeologists working here," says Evgeny Svyatov, an anthropologist from Yekaterinburg. "My goal is to thoroughly study the remains of the buried people. This is important for understanding what they ate, from where they migrated, their hygiene practices, as well as that society’s customs and rites." Excavations continue at Zeleniy Yar, with scientists flocking there from various Russian regions --- the Urals, St. Petersburg, Western and Eastern Siberia --- to see the unique site. Besides archeologists and anthropologists, geneticists are also participating in the excavations. The Yamalo-Nenets region is one of the most northern regions in Russia, and has a very short excavation season due to its Arctic climate; the earth defrosts only towards the end of May, and in August work is halted because of the large swarms of midges, mosquitoes, gnats and horseflies. This year scientists plan to excavate a field that totals 80 square meters. "For now we only have preliminary data about those who were buried in Zeleniy Yar," notes Roman Gilmintinov, a historian from the St. Petersburg European University and a member in the expedition. "It is difficult to say what the results will be because the civilizations of the Russian North do not resemble any other; they are a completely unique world." In the past, a group of experts headed by Natalya Fyodorova found the mummy of a redheaded warrior in Zeleniy Yar during an expedition in 1999-2002. It was dated to 1282 and was well preserved thanks to the permafrost and the oxidation of copper items found in the grave. Mummified remains of four children were discovered the same year. Currently, the archeological area is divided into three parts: the foundry from the 6th-8th centuries; and two burial grounds, one from the 8th-9th centuries, and one from the 12th-13th centuries. During the excavation process researchers are careful to educate the local population. Residents of Siberian villages do not have a positive attitude towards outsiders who excavate their ancient land. It does not help that a few people accidentally died in the village after the graves were discovered. Locals believed the reason was the anger of the ancestors, whose spirits were disturbed by the archeologists. "When we started our activities local residents did not understand why we were exhuming mummies," says Natalya Fyodorova. "We had to constantly meet with them and explain why our research is important for their community and for world history."